January is such a bugger of a month. Combine empty bank accounts, physical and emotional burn out and a return to the office after an all-too-short Christmas break and you have a sure-fire recipe for disaster. And then to top it all off, the weather and the excesses of the season go and wreak havoc on our skin, as well. But thankfully, that’s one area where we can start to take back control with a selection of products to soothe, balance and detox our frazzled hair and skin. So here’s what I’ve been using to ease my way back into some semblance of normality. ONE: Enthusiastic trialling of various volumising powders and sprays throughout the party season has left my hair in dire need of a detox. Enter Ojon Full Detox shampoo (€24, from Arnotts) which is intended for use once a week to gently but effectively remove build-up, detangle and add shine to lacklustre locks. TWO: I had to try Origins Clear Improvement mask after reading Karen’s great review on Lovely Girlie Bits, and I’m so glad I did. Clears pores, dissolves impurities and keeps breakouts at bay – an essential for this time of year! THREE: This Ojon Dry Recovery Mask takes just two minutes to provide intensive moisture for my frazzled, dehydrated hair. With nourishing Blue Agarve, Shea and mango butters and jojoba oil as well as the eponymous oil of ojon, this makes a noticeable difference to my stressed out tresses. This is priced at €33.50 and you can pick it up from Arnotts, Dublin. FOUR: I was coming to the end of my L’Occitane lavender bubble bath when I was sent this moisturising Avon Planet Spa Provence Lavender and Jasmine Softening Bath Soak. Combined with my L’Occitane candle, it provides an effective and relaxing antidote to the winter blues by transporting me back to last summer in Provence. Blissful. 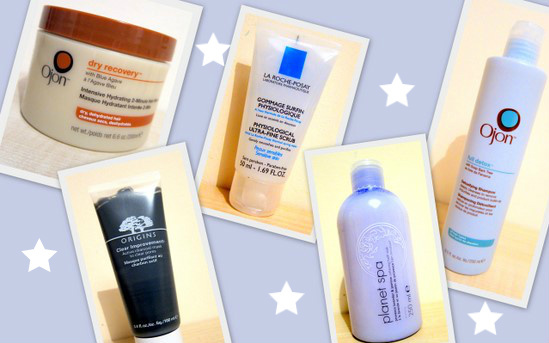 FIVE: La Roche Posay Physiological Ultra-Fine Exfoliating Scrub is a very long name for a very lovely little product. Both effective and gentle, this seeks to purify even the most sensitive skin while respecting its physiological balance. Just the right amount of scrubbiness to sort out my clogged up winter pores without feeling like I’m grating at my skin. €14, from pharmacies nationwide. What’s sorting your hair and skin out this January? I am going to try that Ojon stuff for sure. The problem is with this weather is that the minute you have your mane looking anyway reasonable, it get rained on, blown apart or snowed on. I really want to try out the Origins mask This will be the year I'll finally try out some of their skincare range lol! 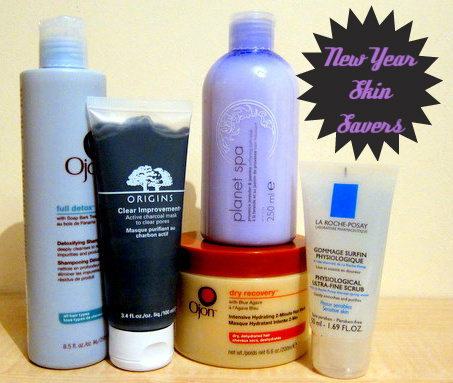 I'm dead set on sorting out my skin for the New Year, being 23 and still feeling like a teenager isn't good! Thanks for sharing, I'll have to check some of these out! I'm currently loving Olay, Loreal and Roc products. I just splurged on skincare. Winter has finally kicked my rump. Time to switch 'er up! I need to detox and beautify!! I love the products you recommended because they're so fab! I hope you'd suggest a hair removal cream too so I won't have to undergo laser hair removal long island because it's a bit expensive. Well who needs dermal fillers if you can have all those toiletries, eh? I bet that can be pretty expensive to maintain too.